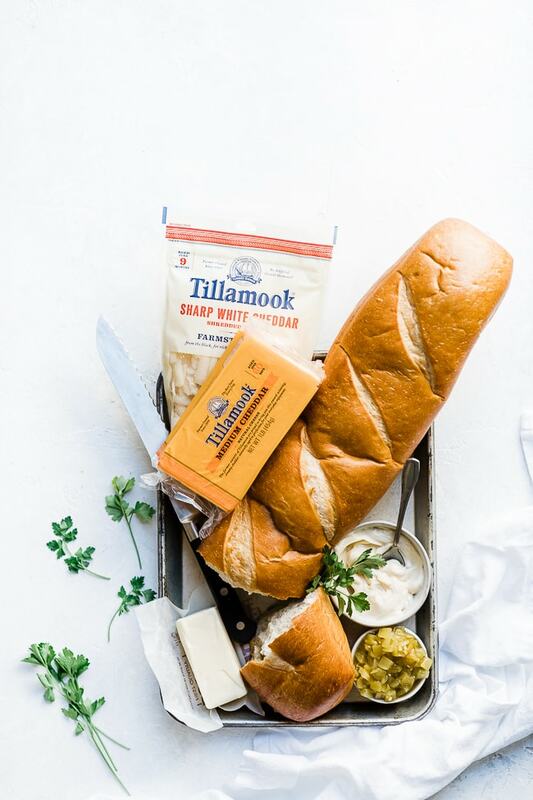 Hot crisp crusts, melty cheese, tangy green chilis, and soft French bread are basically a match made in heaven. 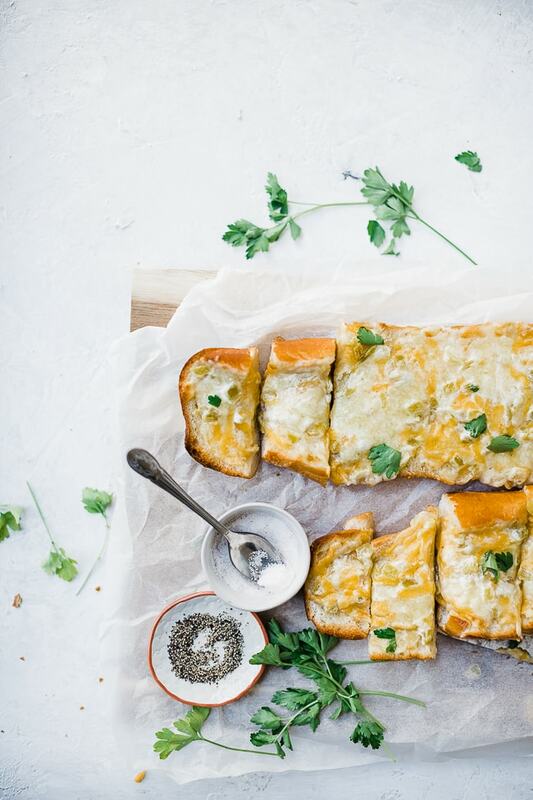 This green chili cheddar bread will spot, and you won’t break a sweat making it either! 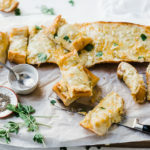 What Do I Need To Make Green Chili Cheddar Bread? Step 1: Start by making your spread. Combine softened butter, mayo, and diced green chilis in a medium sized bowl. Step 2: Stir in grated cheeses. Step 4: Slice french bread in half – lengthwise. Step 5: Spread the mixture evenly on each half of bread. Step 6: Place on a baking sheet, cheese sides up, and bake at 500 degrees for 5 minutes. Turn oven to broil and continue to cook until bubbly. 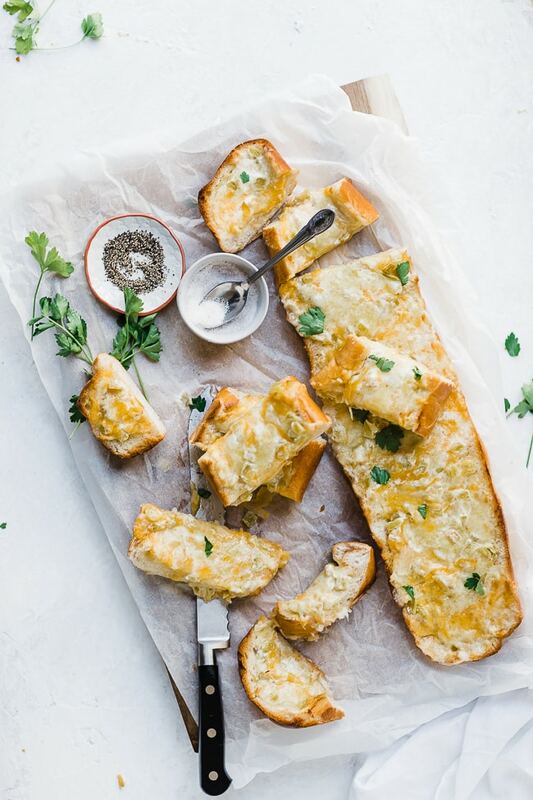 Why not add minced garlic mixed with the butter for an extra garlicy, cheesy bread. Top with cooked bacon pieces. 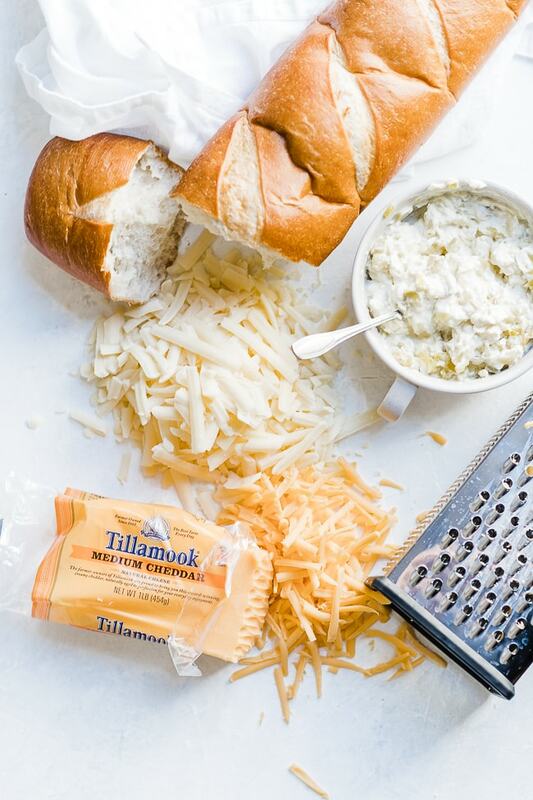 Add other good melting cheeses like Monterey jack or mozzarella. What Do I Serve Chili Cheddar Bread With? This crusty, bubbly, cheesy green chili bread pairs well with a lot of soups or Latin-themed salads. 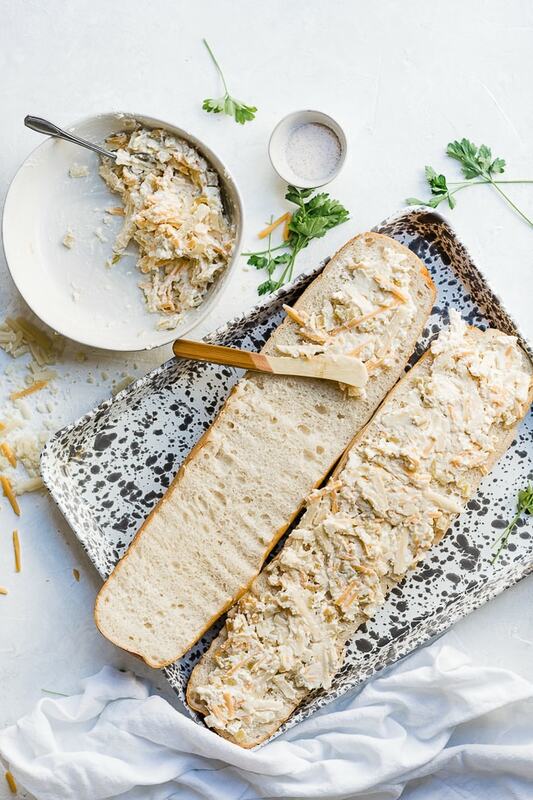 Such a tasty alternative to garlic bread! And it comes together in about 10 minutes. Try it with our Arugula Salad or our Caprese Salad. 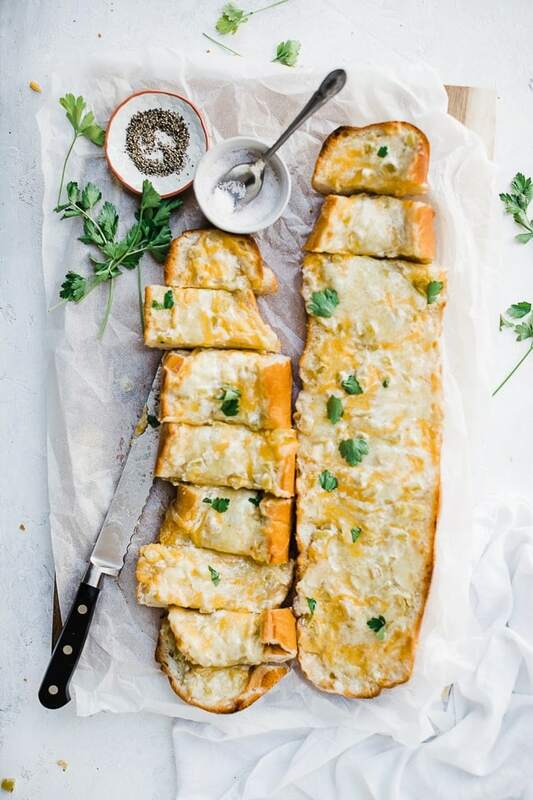 If you tried this Green Chili Cheese Bread or any other recipe on the blog then don’t forget to rate the recipe and leave us a comment below. You can also follow us on Facebook, Twitter, Instagram and Pinterest to see what else we’re getting up to! Family favorite green chili cheese bread. Delicious and easy! Mix mayonnaise, butter, cheese, and chilies. Split french bread in half lengthwise. Spread mixture on both halves of bread. Change oven to broil, broil until cheese melted and bubbly. We still use this recipe…probably more often than we should :) it’s just soooo tasty! Thanks Stephanie! Haha I love it, Hailey. You can thank my momma! Omg drooling at this…I need to make it!